We are entering dangerous waters and Obama better grow a backbone quickly… If Obama does what he did on the muslim tv interview then we are going to empower terrorist even more. Ahmadjinejad has seen a weakness in Obama, his interview as well as the public statement by Ambassador Rice regarding direct talks with Iran without preconditions, and he is making his first move to exploit it. TEHRAN, Iran — Iranian President Mahmoud Ahmadinejad called for “profound changes” in U.S. foreign policy on Wednesday, including giving up support for Israel, during an address to thousands of people in the western city of Kermanshah. Without mentioning President Barack Obama by name, Ahmadinejad Wednesday repeatedly referred to those who want to bring “change,” a word used often in Obama’s election campaign, and indicated that Iran would be looking to see if there would be substantive differences in U.S. policy. Ahmadinejad also demanded the U.S. apologize for ‘crimes’ committed against Iran; specifically, criticizing and trying to block their nuclear program. “Those who say they want to make change, this is the change they should make: they should apologize to the Iranian nation and try to make up for their dark background and the crimes they have committed against the Iranian nation,” Ahmadinejad said. Later Tuesday, U.S. Secretary of State Hillary Clinton told reporters that the U.S. administration is undertaking a wide-ranging and comprehensive survey of U.S. foreign policy options toward Iran. Clinton also said Iran had a “clear opportunity” to demonstrate some willingness to engage meaningfully with the international community. Iranian Deputy Foreign Minister Mehdi Safari, speaking in Athens, Greece, said Tuesday that it was too early to say whether relations with the United States would improve with Obama as president. Washington is at odds with Tehran over Iran’s nuclear program and its Mideast policy that seeks to destroy Israel and supports the militant groups Hezbollah and Hamas. The U.S. and some of its allies accuse Iran of seeking to build nuclear weapons. Tehran denies the charge and refuses to give up uranium enrichment, saying it has the right under the Nuclear Nonproliferation Treaty to produce nuclear fuel. “Who has asked them (the United States) to come and interfere in the affairs of nations?” Ahmadinejad said. via FOXNews.com – Ahmadinejad Demands Apology for U.S. ‘Crimes’ – International News | News of the World | Middle East News | Europe News. President Obama did a quick pivot Monday, shifting his focus to foreign policy by contacting a handful of major world leaders — including Russian President Dmitry Medvedev and French President Nikolas Sarkozy — as his new U.N. ambassador restated the desire for vigorous and “direct diplomacy” with Iran. Obama spoke with the foreign leaders ahead of a meeting with Secretary of State Hillary Clinton and his Middle East envoy George Mitchell, who was leaving immediately afterward for a trip to the region. Mitchell will go to Cairo, Egypt; Jersusalem, Israel; Ramallah in the West Bank; Amman, Jordan; Riyadh, Saudi Arabia. He will also visit Paris and London. Back in the U.S., U.N. Ambassador Susan Rice, who was confirmed last week for the post, said Monday that Iran’s refusal to meet international obligations will increase pressure on Tehran to drop its nuclear ambitions and cooperate with the United States and global community. Besides pursuing nuclear weapons, Iran has called for the destruction of Israel and support for Hamas, a terror group designated by the U.S., Israel and the European Union. White House Press Secretary Robert Gibbs said Rice’s remarks are not a departure from statements made previously by Obama the candidate. She merely restated the administration position that no forms of communication should be off the table with the Islamic regime. “Whether you were on the campaign trail or not, clearly this was something that generated a lot of coverage over the past two years. And I think Ambassador Rice was simply restating the position that the president had,” he said. Gibbs did not offer any specific initiatives on dealing with Iran, but said Rice’s remarks should come as no surprise. “This administration is going to use all elements of our national power to address concerns” about Iran’s nuclear program. State Department Spokesman Robert A. Wood said the purpose of the trip is to consult with regional leaders on a range of issues, including trying to contain smuggling into Gaza to prevent the rearming of Hamas, the Islamist movement that rules Gaza. He said Mitchell will not meet with any Hamas leaders. via Obama, Iran Talks Next? – First 100 Days of Presidency – Politics FOXNews.com . More Change You Can Believe In! NEW YORK — President-elect Barack Obama’s vast list of donors is being asked to donate to Hillary Rodham Clinton as she scrambles to reduce her massive campaign debt before she becomes secretary of state and federal ethics rules limit her fundraising, an Obama adviser said Thursday night. An appeal on Clinton’s behalf signed by Vice President-elect Joe Biden is to be sent by e-mail to all of the more than three million donors to Obama’s record-setting fundraising, according to this adviser, who spoke on condition of anonymity because the e-mail had not yet been sent. Obama promised after Clinton endorsed him to help her pay off her debt and this is the second time the Obama list has been asked to help Clinton. It was used once during the campaign as well, but its second use underlines the urgency of Clinton’s task now that she is Obama’s choice to be secretary of state. Clinton and her husband, former President Bill Clinton, will headline a major debt retirement event in New York Dec. 15 with “Ugly Betty” star America Ferrera as master of ceremonies. Tickets range from $50 to $1,000, with top donors earning a premium seat and a backstage photo with the former first lady. Clinton also plans to sell a children’s book, titled “Dreams Taking Flight” by author Kathleen Krull, about her pioneering candidacy. Clinton’s mother, Dorothy Rodham, planned to send an e-mail to supporters later this week asking them to purchase the book to help raise funds to pay down Clinton’s debt. On Tuesday, a day after Obama announced she would serve as his top diplomat, Bill Clinton signed an e-mail to supporters asking them to send a note of congratulations to his wife and including a link for contributing to her debt retirement. The urgency is rooted in the size of the New York senator’s unpaid bills and the fundraising restrictions she will face once she joins Obama’s cabinet. At the beginning of November, Clinton owed $7.5 million to vendors from her failed presidential bid, according to campaign finance records. The largest share of the debt — about $5.3 million — is owed to the polling firm of Mark Penn, the Clintons’ longtime political strategist. She owes hundreds of thousands of dollars for printing, equipment rental, phone banks and other services. Clinton has slowly been trimming the debt since suspending her campaign last June, partly with Obama’s help. But her fundraising efforts will be curtailed if she is confirmed as secretary of state and becomes covered by the Hatch Act, which regulates political involvement by federal employees. A 2001 advisory opinion by the federal Office of Special Counsel said a federal employee with a campaign debt would be prohibited from “personally soliciting, accepting or receiving political contributions.” That means Clinton’s political committee could keep raising money to pay off her creditors, but without her direct involvement. The lack of access to Clinton could pose a disincentive for donors, said Sheila Krumholz, director of the Center for Responsive Politics, which tracks political donations. The advisory opinion does allow the former candidate to appear briefly at fundraising events and thank donors. That restriction could suit Clinton well, according to some of her top bundlers who say neither she nor her husband has ever been good at asking for donations. But none of the Hatch Act rules apply until Clinton is confirmed, so there’s an opportunity for people eager to get some face time with the incoming secretary of state. Aides said she will try to avoid doing anything that suggests she is leveraging her new post for fundraising advantage. Brad Smith, a former Federal Election Commission chairman, said Clinton would be wise to avoid any appearance of conflict of interest. Clinton’s new job will help her avoid some pitfalls that loom when political access linked to campaign donations. For example, foreign citizens, who might be interested in forging a relationship with an incoming secretary of state, are legally barred from contributing to U.S. political campaigns. Still, Krumholz said, there are plenty of U.S. citizens with strong ties to other countries who would welcome the chance to write Clinton a check. “Wealthy people who have family overseas and are tied to issues in the country — human rights issues, for example — have more incentive to give,” Krumholz said. Analysts said that fundraising to retire a politician’s debt — never easy — is more difficult during the recession. Also, Clinton is trying to pay off debts from the Democratic primaries, where many of her supporters already gave the maximum $2,300 per person. They cannot be solicited again. The large share of her debt owed to Penn, a controversial figure and harsh Obama critic, also complicates matters for Clinton. Many Democrats blamed him for her strategic failings. Clinton also has about $6 million in her Senate re-election account; some of that could be used under strict restrictions to help pay these debts. Under FEC rules, she would need to ask each contributor’s permission to move the donation to her debt retirement account — and none could come from people who already contributed the maximum to her presidential bid. Why on earth would Barack bring back a member of his team that was forced to leave in the first place. That is not part of the healing process, it shows that he did anything to win the election and now that it is over and he won, he will do whatever he wants. Obama’s advisers have begun looking into Bill Clinton’s foundation, which distributes millions of dollars to Africa to help with development, to ensure that there is no conflict of interest. But Democrats do not believe that the vetting is likely to be a problem. Clinton would be well placed to become the country’s dominant voice in foreign affairs, replacing Condoleezza Rice. Since being elected senator for New York, she has specialised in foreign affairs and defence. Although she supported the war in Iraq, she and Obama basically agree on a withdrawal of American troops. Clinton, who still harbours hopes of a future presidential run, had to weigh up whether she would be better placed by staying in the Senate, which offers a platform for life, or making the more uncertain career move to the secretary of state job. As part of the coalition-building, Obama today also reached out to his defeated Republican rival, John McCain, to discuss how they could work together to roll back some of the most controversial policies of the Bush years. Putting aside the bitter words thrown about with abandon by both sides during the election campaign, McCain flew to meet Obama at his headquarters in the Kluczynski Federal Building, in downtown Chicago. Obama, speaking before the meeting, said: “We’re going to have a good conversation about how we can do some work together to fix up the country.” He said he also wanted to thank McCain for his service to the country. Asked by a reporter whether he would work with Obama, McCain, who has long favoured a bipartisan approach to politics, replied: “Obviously”. Sources on both sides said Obama did not offer McCain a cabinet job, but focused on how the senator for Arizona could help to guide through Congress legislation that they both strongly favour. Given Obama’s status as president-in-waiting, the two met in a formal setting, a room decked out with a US flag, and were accompanied by senior advisers. Obama appeared the more relaxed of the two, sitting with legs crossed, smiling broadly and waving to reporters, while McCain sat stiffly, with a seemingly fixed grin. Although the two clashed during the election campaign over tax policy and withdrawal from Iraq, they have more in common than they have differences. They both favour the closure of the Guantánamo Bay detention centre, an increase in US troops to Afghanistan, immigration reform, stem cell research and measures to tackle climate change, and oppose torture and the widespread use of wire-tapping. Although Democrats made gains in the Senate in the November 4 elections, they fell short of the 60 seats that would have allowed them to override Republican blocking tactics and will need Republican allies to get Obama’s plans through. This was highlighted today when the Democratic leadership in Congress announced that a broad economic stimulus package Obama sought was not likely to be passed because of Republican opposition. Obama confirmed at the weekend that he would offer jobs to some Republicans. One of the names that crops up most often is Chuck Hagel, the former Republican senator who is a specialist in foreign affairs and a critic of the Iraq war. Here we go… America voted in the One… Get ready for a ride of your lifetime… More Change You Can Believe In! Well it didn’t take long. Less than one week after the U.S. election, here comes One World Government right on cue. Exit stage left. Make that for the entire world, not just the elusive unproven rookie who will transform the United States of America from a democracy into Socialism. The international financial crisis has given world leaders a unique opportunity to create a truly global economy, Britain’s Prime Minister Gordon Grown will say in a keynote foreign policy speech on Monday. 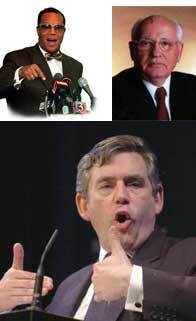 “In his annual speech at the Lord Mayor’s Banquet, Brown—who has spearheaded calls for the reform of international financial institutions—will say Britain, the United States and Europe are key to forging a new world order.” (Reuters, Nov. 9, 2008). Do any find it too much of a coincidence that international financial institutions—the world over—collapsed at the same time orchestrating the total crash of Capitalism? At the same time, former Soviet leader Mikhail Gorbachev has advised that the Obama administration in the United States needs far-reaching `perestroika’ reforms to overcome the financial crisis and restore balance in the world. Make that the same Gorby who had his American capitalist pig friends arrange millions of dollars for him before he even bailed out of a failing Soviet Union. The former Soviet leader was handed the keys of a house overlooking the Golden Bridge at the Presidio and has been fomenting for revolution ever since. A confrere of One World Order lusting, New Ager Maurice Strong, this deadly duo had the arrogance to rewrite the Ten Commandments of Moses. If that wasn’t enough change in less than a week since the victory of President-elect Barack Hussein Obama, Nation of Islam Minister Louis Farrakhan has openly named Obama the “New Beginning”. Obama has yet to keep a single promise made to the depressed, downtrodden, rejected and despised. He was elected in one of the most voter fraud challenged elections to date, and there are those who dare argue that he only used the downtrodden to get himself elected as U.S. president. Notice how the global elitists seem to be speaking with one voice about dramatic changes to the world, as we know it through Obama. But now we know for sure what Obama meant by change. It’s the change the big Pooh-Bahs are demanding, the end of democracy in America, the dawn of the New World Order coming at us within days of the election of their `Agent for Change’. “…If we learn from our experience of turning unity of purpose of action, we can together seize this moment of change in our world to create a truly global society,” Brown will say in tomorrow’s address. That’s Brown’s stampede to the New World Order. Imagine Gorbachev, who lived comfortably in the US all these years now turning around to bite the hand that feeds him. Gorbachev told Italy’s La Stampa that after transforming his country in the late 1980s, he had told the Americans that it was their turn to act, but that Washington, celebrating its Cold War victory, was not interested in “a new model of a society where politics, economics and morals went hand in hand”. Why should Americans listen to a leader collecting American contributions on American soil from a man who has never denounced Communism? He told La Stampa that “the world is waiting for Obama to act”, and that the White House needs to restore trust in cooperation with the United States among the Russians. Glad that Gorbachev knows the real Obama, very few others do. And just to think we were worried about Obama’s ties to Saul Alinsky! Without serving a day as President, Obama has reached sainthood among the global brotherhood. For the millions who were waiting, change came slinking out of the closet this weekend. Problem is it is a change that will break human spirit as it takes the masses back to serfdom.